Daniël Christiaens received his M.A. in art history at the Katholieke Universiteit Leuven in 1982. His thesis on 20th-century fashion, The relation between fashion and the visual arts during the Interbellum: with special attention given to Sonia Delaunay, was a first at that university and parts of it were published in various magazines and bulletins. He has also lectured on the topic, and currently advises students working on fashion history. During the winter of 1983 he volunteered at the Middelheim Open Air Sculpture Garden. In 1984 he began working for the Belgian OCMW (Openbaar Centrum voor Maatschappelijk Welzijn / Centre Publique d’Aide Sociale / Public Center of Social Welfare), where he initially curated an exhibition on the history of medical instruments and technology in 1988. From 1988 to 2003 he was a staff member of ELZENVELD, a socio-cultural center and exhibition space (part of the Antwerp OCMW), where he co-curated various exhibitions on contemporary artists from Belgium and abroad. Since 2000 Christiaens has focused on the Maagdenhuismuseum, an orphanage for girls founded in 1552/53, which was turned into a museum in 1930. The museum festively celebrated its 80th anniversary on 24 June 2010. A small documentary exhibition was on view until the end of July. Christiaens was officially appointed senior curator at the museum in 2006. 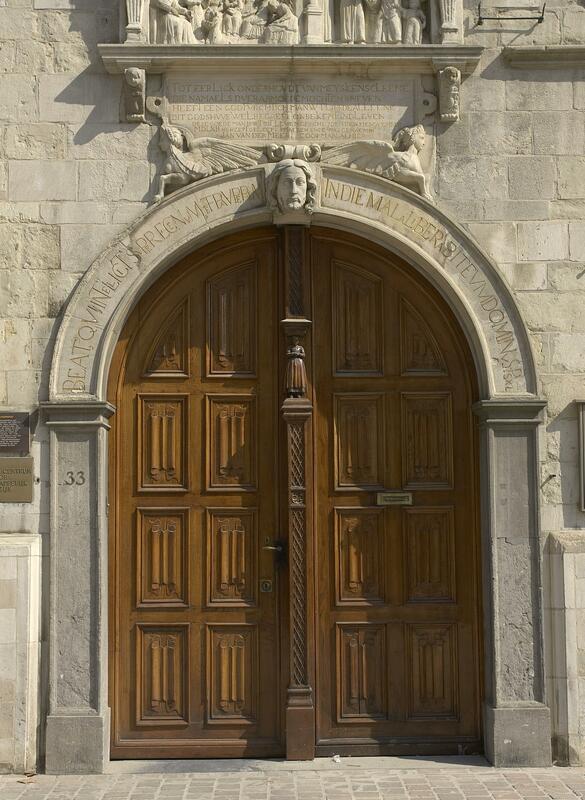 The Maagdenhuis is one of Antwerp’s smallest museums and figures prominently in the Public Center of Social Welfare’s early history. It still operates within the margins of this institution. Located in one of the city’s precious historic landmarks, the Maagdenhuis Museum is currently implementing professional approaches, including digitization (approximately 3,000 entries), restoration, and improvement of the state of the art museum infrastructure and technology through the application of a Solar Gard solar and UV protective window film, LED lighting, security, etc. It is not easy to select a favorite work from the museum’s collection, but the Portrait of Simon de Vos by Abraham de Vries (1590-ca. 1650) certainly stands out. De Vries was born in Rotterdam and initially was influenced by Thomas de Keyser and subsequently by Rembrandt and Frans Hals. He was first mentioned in the parish registry of his birthplace in 1617. Eleven years later he was in Antwerp. From 1630 to 1640 he was active in Amsterdam, except for brief sojourns in Paris in 1634-1635, and Antwerp, where he received the title of “full master” in 1634. A decade later, he was accepted as a master in the Guild of Saint Luke in The Hague, and also in Rotterdam in 1647. He died in 1650. Several documents support the reading of the monogram as that of Abraham de Vries. A preliminary study for this portrait is in the Musée des Beaux-Arts in Lyons, France. The panel is striking, thanks to its vigorous execution and restrained color scheme. Simon de Vos is portrayed as a cheerful, elegant man of the world. It is one of the most charming portraits in the collection and also expresses contemporary views of charity: art and history coincide here in a beautiful and touching manner! In conclusion, it feels odd to feature as Curator in the spotlight page among colleagues from the British Museum, the Kunsthistorisches Museum and so forth! Eight people work at the Maagdenhuis Museum (including one academic), giving you some idea of our position with respect to the more than 2,000 personnel of the Openbaar Centrum voor Maatschappelijk Welzijn / Public Center for Social Welfare!